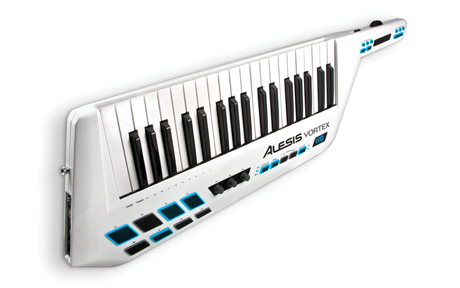 Update 16/1/31: The Alesis Vortex has been replaced by the Alesis Vortex Wireless . But the links below about in-depth reviews and complete user manual are still applicable and current. It’s a Keyboard/Midi controller: a keytar. You might read all sorts of reviews already. You might, or might not, like the idea. For me, two things are important: first, it’s not available yet(! )(not before May 2012) so, as far as I’m concerned, cannot be reviewed. Second, I’m looking at the controller possibilities. So this post is about the Vortex’s technical specs (or what I get/imagine from the Alesis site. I will probably get a unit when it’s available. So you will have to come back for more! This entry was posted in Electronics and tagged processor, Vortex. Bookmark the permalink. Sounds like fun 🙂 Unfortunately, on the link provided, the “Find a dealer” option only lists USA & UK – no Australia 🙁 Not saying I’ll get one, but would be fun to test one! I looked at the Roland AX-09. Similar controls as the Alesis Vortex but includes it’s own synthesizer. That’s the main difference. The Roland is meant to be a “do-it-all” instrument that can be plugged in as your only instrument on stage. It even has sound input (like MP3) so you can merge pre-recorded sounds to your output stream. The Alesis is a Midi controller only. By itself, it doesn’t make a “peep”. It is much more assignable than the Roland, though. Every key and knob can be programmed. For me, the Vortex is more appealing. I never play without a synthesizer/computer/iPad anyway. So my needs are for a programmable controller. I currently use an M-Audio Oxygen 25 (http://www.m-audio.com/products/en_us/Oxygen49.html) that I even thought of modifying to make it portable (à la keytar!). It does what these two keytars do, and more. It’s even roughly the same size and weight! I will get the Vortex for it’s easier use of the pitch wheel and that “touch bar”. Also, the little touch pads are great for rhythm and sample triggering. Finally, the price: the Roland AX-09 is 600$. 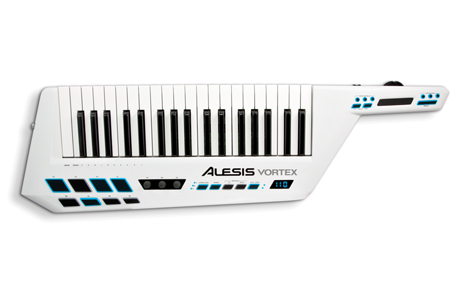 The Alesis Vortex is 300$. Ouch!